iron stef: STL food bloggers potluck! 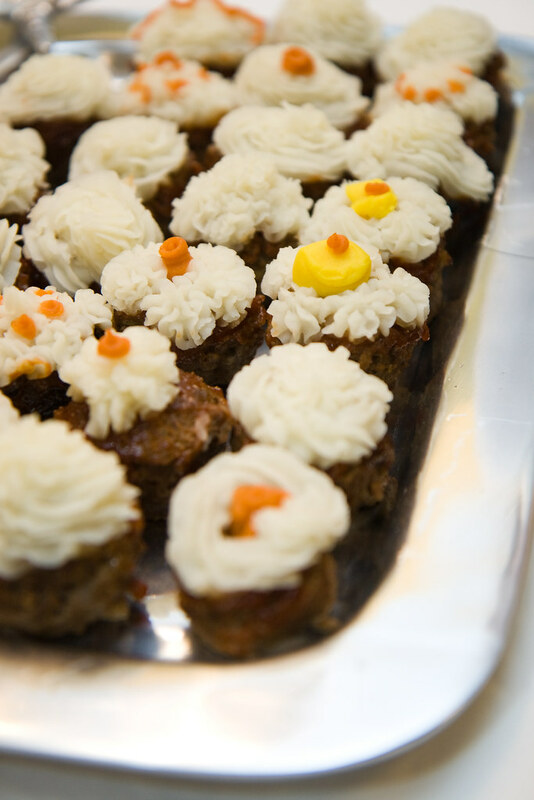 This pretty pretty picture of my mini meatloaf cupcakes was taken by Jonathan Pollack at a potluck he and his wife, Stef from Cupcake Project, generously hosted at their home on Sunday. Jonathan is a wonderful photographer with a camera set-up that gives me major lens-envy. Check out his site! Hire him! So yes, I made the famous meatloaf cupcakes. Pretty much the same as here. I did make some colorful mashed potatoes for little extra pizazz...one batch was orange, made by adding lots of paprika, and one batch was bright yellow, made using turmeric and saffron. As always, they were delightful. That dish I am lunging eagerly for has some potato flatbreads that Nupur from One Hot Stove made. She had a curry sauce and several fixin's to go with them. Man those were good. (EDITED TO ADD: Nupur sent me the link to her blog entry on how to make these glorious nibbles. In her e-mail, she adds: "But I posted this recipe such a long time ago, and the way I make it now is a little different :) The patties that I made had a little turmeric, ginger and garlic in addition to the ingredients mentioned. The curry- I skipped the tamarind and jaggery (unrefined sugar) because I served the chutney on the side.") I could have eaten them all night. Except there was so much other awesome food to eat, too...including some amazing desserts. I guess you'd expect as much from a gathering of food bloggers, huh? Still...I needed another stomach. For real. For instance, check out Kelly's Tyler's Ultimate mac & cheese. Barbaric Gulp indeed! Also, you can see more of Jonathan's photos from the evening (they'll make you drool) by going to his website and entering the code FOODBLOG in the box below. smith family recipes -Margaret recaps the potluck, and here's the recipe for her dish, the fabulous "Unnamed Italian Dish." sounding my barbaric gulp -Kelly's recap and recipe for her dish, Tyler's Ultimate mac & cheese. the kitchen at serafina studios -Kristen & Gabriel put some photos and such of the potluck up here. miss food snob -Amy posts her lemon tart recipe here. ZiNur -Natalia's coconut rum cake was a huge hit...like marriage-worthy. Here's her recipe for this "Bienmesabe." show me vegan -Lisa brought Orzo with Roasted vegetables! one hot stove -Nupur, as mentioned above, made divine ragda patties. She writes a bit more about the potluck in this post, after some awesome-looking "dosas" which I need to try. now. 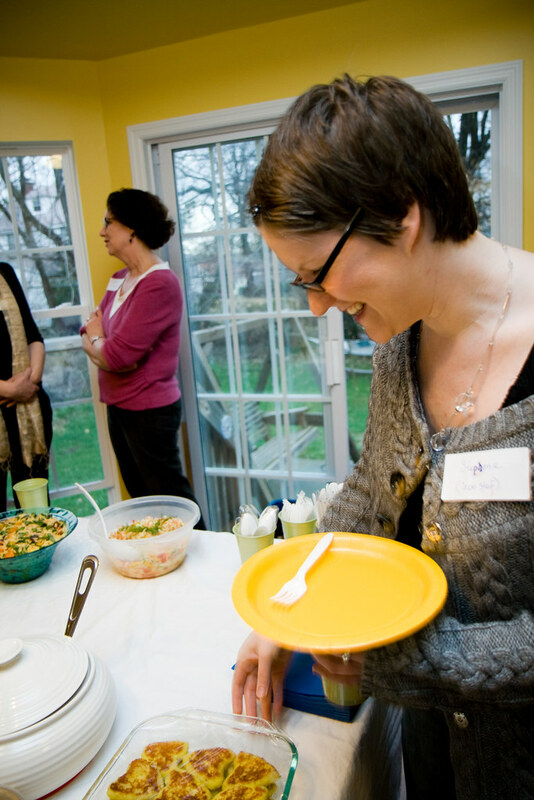 Also, notice one of my favorite photos from the night...the date-tamarind chutney being poured (by moi!) onto a ragda patty. Money shot! cupcake project -Stef made yummy-shmummy lavender cupcakes. It was fantastic to meet everyone. I hope we do stuff like this more often. Please check out these blogs. they rule the Lou! Thanks for the shout-out, Stef! Stef it was fun to talk foodie books! Hope we do this again soon. And your blog looks great! It was fun seeing you again! Loved the "cupcakes". Oooh your get together sounds like so much fun! I love the meatloaf cupcake idea....it must have been April Fool's. Meatloaf cupcakes . . . very cool, playful idea. I'll have to try it and I'll be sure to give you credit! It was great to meet you! Can't wait until the next one. I am going to a Potluck/lecture in our town tonite to learn more about Moose in our area of NW CT, and I typed into Google: "what to make for a potluck dinner" and your post here came up in the list. I went to high school in STL and my family is still lives in STL, and its heartening to see so much food love going on there. I produce a web video show Gardenfork about cooking and gardening and other fun stuff, and Real World Green about practical green tips. I will be in STL soon and I want to videotape my parents cooking in their kitchen, maybe you all will have another get-together that I can attend.